The Rig Veda, or Rg Veda is the oldest of the canonical Hindu texts called the Vedas. Along with the Book of the Dead, the Enuma Elish, the I Ching, and the Avesta, the Vedas are among the most ancient records of doctrine available to us. The Indic language of the Rig Veda reveals a strong linguistic and cultural similarity with the early Avesta, or Zoroastrian scriptures. These languages derive from the proto-Indo-Iranian/Aryan times, which date back as long ago as 7000 B.C.E. In the ancient scripture is a character called Dyaus Pitr (or Pita). ‘Dyaus’ sounds like deeoos. Translated from the ancient Vedic language, Dyaus Pitr means ‘Sky Father’. 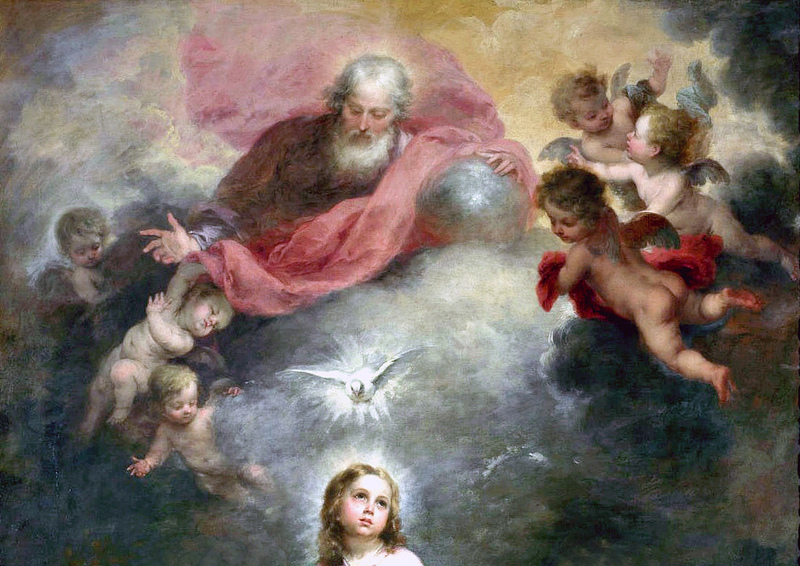 From ‘dyaus’, comes the words ‘theos‘ and ‘deity‘, and theologies about a deity in the sky persist, even today. 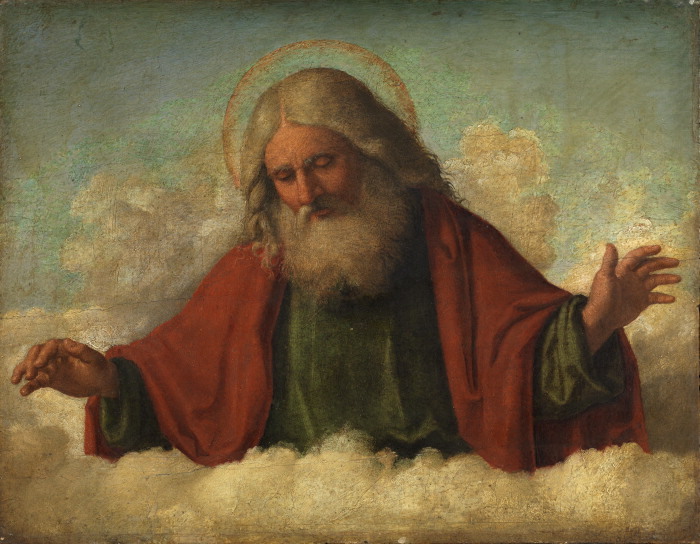 The Judeo-Christian Father God is depicted in religious art as an elderly white man with a full beard who lives in the clouded sky. Since the story of Dyaus Pitr was first told, thousands of years have passed. We have learned that the earth is not the center of the universe; and for that matter, neither is the sun! (Giordano Bruno was burned at the stake for suggesting this.) Half a century ago we sent men into orbit around the earth, and for the past quarter-century, the Hubble telescope has been in operation. We know full-well there is no old white dude living in the clouds! Children fooled by adults to believe stories about a gift-bearing Santa Claus, a wish-bearing genie, or an egg-bearing Easter Bunny, come to see the game of it by the time they start school; yet, somehow, this ‘sky father’ motif has endured unchallenged through the ages. From ‘Dyaus’ we get the Greek god’s name, Zeus; and from ‘Dyaus Pitr’, we get the Roman god’s name, Jupiter. We do explain to middle-school students that these two different names refer to one and the same mythological character; however, we do not tell the kids that these names link the mythological ‘sky father’ to the Bible’s “Father Who art in Heaven”. The words, divine, diva, devis and devas (goddesses and gods), are all cognates that share the syllable, ‘div’, which means ‘to shine’. In ancient and medieval Indian mythology, each masculine deva is partnered with a feminine devi. ‘Dyaus’ sounds similar to the Latin word ‘duos‘. In Old French, deus means two. (In modern French the spelling has changed to deux.) Duo/two is linguistically linked to deus/God. Built into our language is evidence that the One comprises Two opposite forces, which dynamically operate in exquisite balance. The whole wide world is only he and she. In the Vedas, Dyaus Pitr was accompanied by Prithvi Matr (or Mata). Translated, Her name means Earth Mother. The valley spirit never dies; it is the woman, primal mother. Her gateway is the root of heaven and earth. Thou indeed art the undifferentiated first cause, the highest Prakriti. Oh, Divine Mother! She became the universal womb, for She precedes everything. Those quotes, though not well-known in the West, tell of the Feminine involvement with Creation. There is never a mention of a Female companion to the Father God. [T]he absence of feminine symbolism for God marks Judaism, Christianity, and Islam in striking contrast to the world’s other religious traditions, whether in Egypt, Babylonia, Greece, and Rome, or in Africa, India and North America, which abound in feminine symbolism. An aside is offered to expand the discussion on Gender Roles. From the first visions, Quadernity revealed itself in divisions. 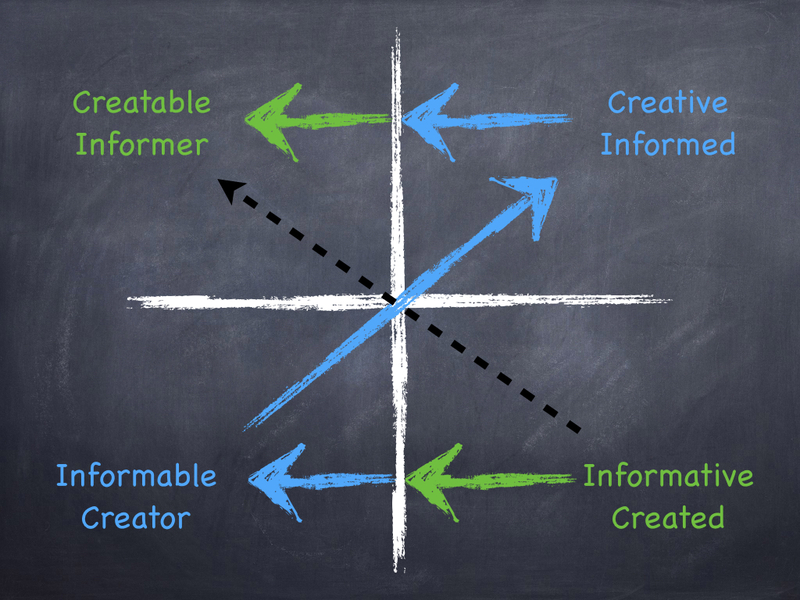 The inverse, complementary processes of Creation/OUTformation and INformation include four quadrants, upper and lower, and right and left. Please use the following links to Essential Vocabulary’s special definitions: Feedback of INformation and OUTformation and Subjectivity and Objectivity. We learned that Subjects (left quadrants) are at the cause of actions, Creating/Outforming (LLQ) or INforming (ULQ), and that Objects (right quadrants) are effects of the actions which produce them. In this essay, we will explore the metaphysical and physical domains, represented in the graphic below by the upper and lower quadrants, respectively. The diagonal arrows in the graphic above connect the dual domains. The Subject-Object polarities of OUTformation are Female in nature, and by function. 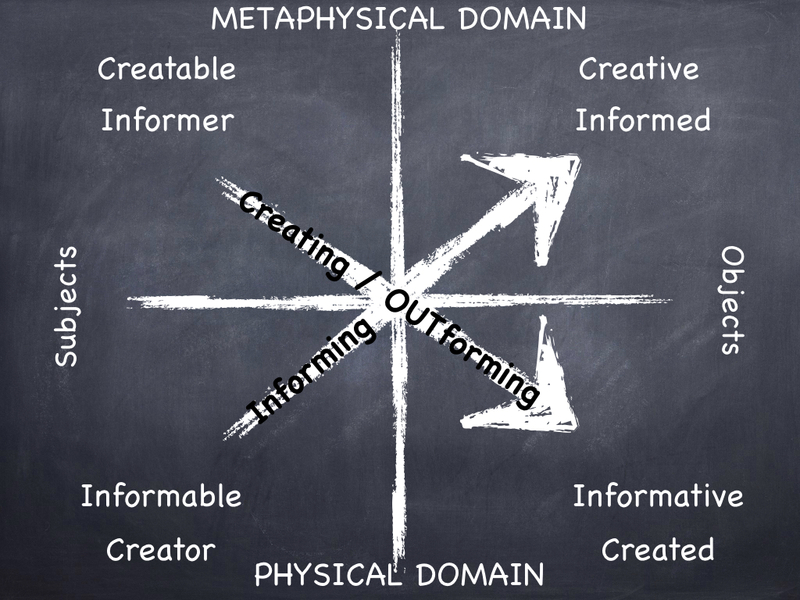 The Creatable Mother’s process flows diagonally from the metaphysical/dark/hidden/private domain (Upper Left Quadrant) to the physical/light/visible/public domain (LRQ). The Female’s output is Informative physical embodiment, or Created physical Matter. The Subject-Object polarities of INformation are Male; the INformable Father’s process proceeds diagonally from the physical domain of sensory stimuli (LLQ) to the metaphysical domain of memories (URQ). The Male’s output is Creative metaphysical Patterns, or Informed enmindedness. Our primal Subjects have been depicted and mythologized since ancient times. The archetype of the Father, that is, of the mind [metaphysical], is the polar opposite. The great lovers shall not be rent asunder; nor may physical matter be divided from its metaphysical pattern. Here is colorful aside, offered to provide extra insights about why Patterns Matter. The Mother and Father, as a dynamic duo, represent the essential binary complements at the core of every relationship and are, therefore, fundamental to every entity or system, regardless of scale. The Female and Male relate to each other in the so-called Earthly and Heavenly realms. The aside, Geometry of Universal Mother and Father, will be especially meaningful now. Mother, Creatable Subject, OUTforms Matter, Objects of corporeality that are publicly observed on the Earthly realm (lower quadrants, as seen below). Father, Informable Subject, INforms, or Patterns, Objects of consciousness that privately enter into the Heavenly realm (upper quadrants), a.k.a. the Akashic Records or the Collective Consciousness. The terms ‘Heavenly‘ and ‘Earthly‘ denote the minimally essential, interrelated realms required for any relationship. These contiguous dimensions, along with their dual, co-operative and co-dependent Subjects and Objects, are fundamental to any enduring entity/system (E/S). The Male and Female are engaged in two different relationships, as indicated by the black stars on each of the two contiguous levels/dimensions/domains in the graphic below. The physical realm (lower quadrants) contains discrete material/quantifiable/OUTformed Objects of corporeality, and the metaphysical realm (upper quadrants) contains discreet patterned/qualifiable/INformed Objects of consciousness. Essential Vocabulary offers a comparison of the terms discrete and discreet. The Female Object and Male Subject are singled-out/differentiated; there is relativity. In their public day-time relationship, Mother Earth overtly displays discrete sensuous output/Matter (LRQ) as Informative input for Her partner, the Informable Subject (LLQ). The Male Subjective-Mind is receptive/Informable, and the Female Objective-Body is expressive/Informative. The Male Object and Female Subject are mingled-in/integrated; there is homogeneity. In their private night-time relationship, the Heavenly Father’s conscious output/Pattern (URQ) is discreetly Creative, as it covertly seeds (provides input for) His partner, the Creatable Subject (ULQ). The Female Subjective-Substance is receptive/Creatable, and the Male Objective-Patterns are expressive/Creative. Subjects exist apart from their own Objects. On both of two coterminous dimensions, there is a Subject who (actively) receives as input the (passive) output/Object of the other Subject. OUTformed corporeality and INformed consciousness are cyclically coordinated and recursively cooperative, dynamical actions occurring within the pervasive stillness of the One! I have but one law for all My opposed pairs of creating things; and that law needs but one word to spell it out, so hear Me when I say that the one word of My one law is BALANCE. And if man needs two words to aid him in his knowing of the workings of that law, those words are BALANCED INTERCHANGE. If man still needs more words to aid his knowing of My one law, give to him another one, and let those three words be RHYTHMIC BALANCED INTERCHANGE. In the Bible, the terms God and Father are used interchangeably, confusing the all-encompassing Oneness that transcends the Male–Female partnership with the Creator/Father/Male aspect of the whole. God, Allah, Jehova, Yaweh, etc., are names loaded with meaning for different people today. Calling the unfathomable One by any name could be a limiting and discriminatory practice. Let us avoid triggering associations in diverse devotees. Can we agree with each other that our revered, ineffable Oneness may fairly be described by three simple adjectives: eternal, comprehensive and perfect? Eternal Comprehensive Perfection is an appropriately gender-neutral and impersonal term that stands for all-that-is, the Oneness within which the Male/gods/Father and Female/goddesses/Mother function dynamically. We will consistently use this term, or its acronym, ECP, when referring to the transcendent Source/Ground in which a fundamental dichotomy makes possible life, enduring entities and sustainable systems. 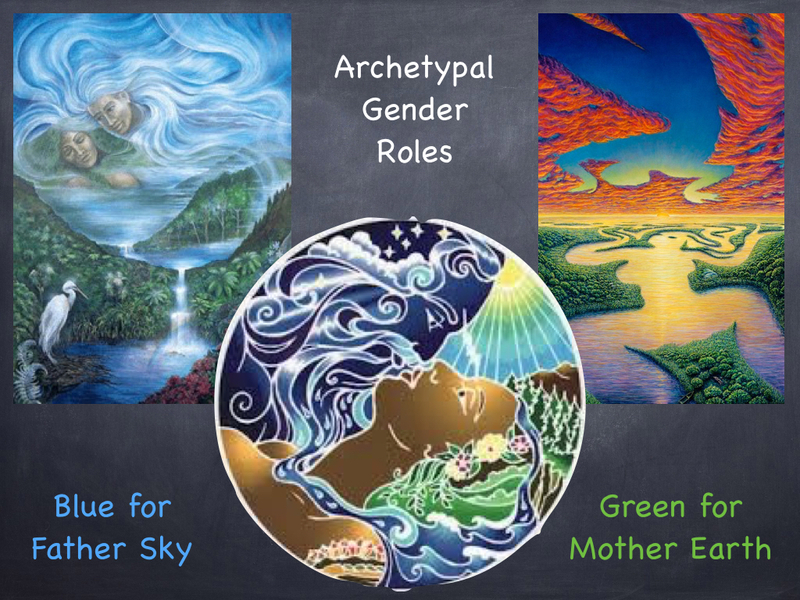 Quadernity maps out this “dynamic relationship of opposites”, archetypally referred to as Male and Female. As seen through the quadrants, both science and scriptures reveal the equal necessity of the Female and Male, each to the other and both to the dual realms of metaphysical Heaven and physical Earth. The upper quadrants are Metaphysical. The lower quadrants are Physical. The left quadrants are Subjects. The right quadrants are Objects. Female quadrants are on the diagonal from ULQ to LRQ. Male quadrants are on the diagonal from LLQ to URQ. Quadernity reveals divinity in all its divisions. 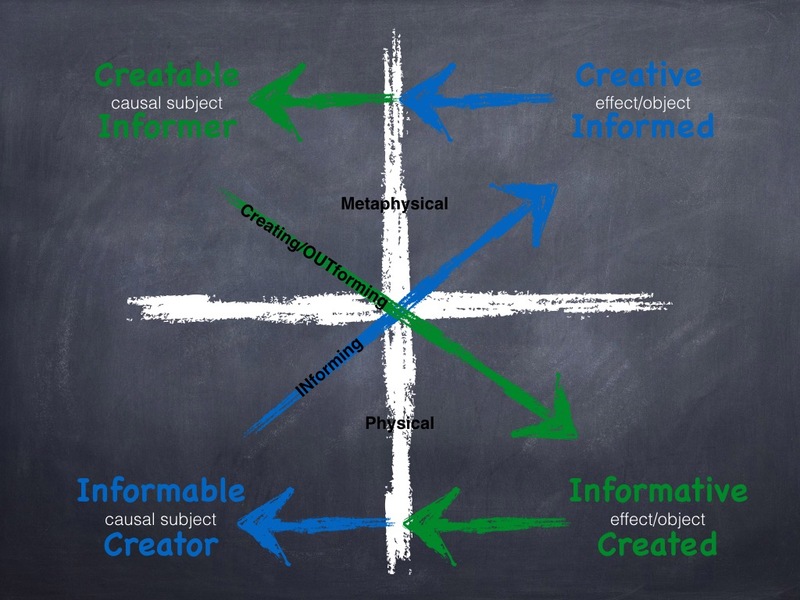 The graphic below depicts the original Quadernity Model, a two-by-two grid, upon which are arranged the now-familiar, though newly color-coded, labels of Creation/OUTformation and INformation, which interface across contiguous domains. URQ = Informed memory Patterns become Creative seeds for recursion. 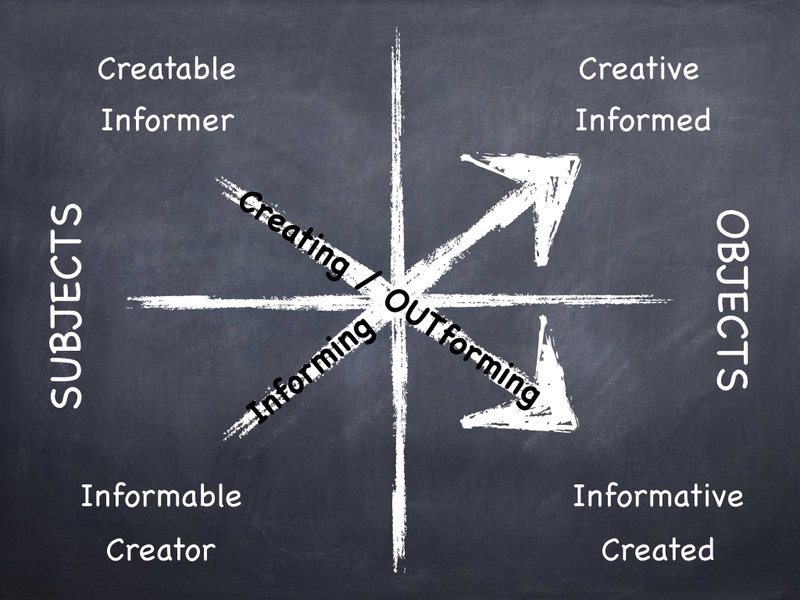 OUTforming and INforming are represented by directionally opposite arrows. A green arrow of Creating/OUTforming crosses from upper to lower Female quadrants, and a blue arrow of INforming crosses from lower to upper Male quadrants. Follow the sequence of three arrows to see that each Subject acts thrice to produce its Object. She projects/Pushes Her Object/Matter into the LRQ. He projects/Pushes his Object/Pattern into the URQ. How does the cycle reset itself to sustain the Creation now manifest and meaningful? Before we get into that, kudos to any reader who recalls the morning vision of an X made with mismatched arrows! Why was one half of the X a solid slash of chalk-line and the other half a black dashed line? In the following section the meaning of the mismatch finally becomes clear. As mentioned in the first essay, a black-dashed line going from URQ to LLQ (see next graphic below) had appeared early on in the visions to help me fill the quadrants with labels of Creation. At that time, I interpreted the vision to mean that the Creative was the potential state of the Creator, who claimed His title only after the Process of Creation was complete (indicated by downward arrows). Now that we have our Quadrants of Information, a different interpretation of the black-dashed arrow is unveiled. The Creator, as causal Subject, could not previously have been Creative. Instead, He was INformable. Both of these labels are in the LLQ, the home-court of the Male Subject. It is the Creator‘s effective Object that is Creative (URQ); it is His Pattern that INforms collective consciousness, which, once INformed (URQ), seeds the Creatable Matrix (ULQ). The retrograde movement of the black-dashed arrow pointing diagonally down from URQ to LLQ (seen in graphic above), indicates that once the Object produced by the Male Subject’s action is projected into the URQ, and while the Female Subject is busily Creating/OUTforming (green diagonal arrow pointing downward), the Subject returns to Rest in the LLQ in order to re-establish His receptivity for another round. We repeat the symmetry to discover that the same is true of the Creatable Informer. In the graphic just below, there is a diagonal black-dashed arrow going up from the LRQ to the ULQ. According to my previous thinking, this arrow appeared to indicate that the potentially Informative became the Informer during the Process of INformation (both arrows pointing upward). However, we now know better. The Informer, as causal Subject, could not previously have been Informative. Instead, She was Creatable. Both of these labels are in the ULQ, the home-court of the Female Subject. The Informer‘s effective Object is Informative (LRQ); that which re-minds the Informable Subject (LLQ) is Her Matter, the OUTformed sensual stimuli. This is the first of several times that a symbol will take on contradictory meanings in my dreams. Initially, a symbol may operate on a basic level of understanding, and at a later time it may work on a higher/deeper/broader level. Often words will take on multiple meanings, each applicable in their own way. My intriguing dreams know how to play word and symbol games with me! Our new insight clarifies that the Subjects never become Objects (as the colored arrows might have previously suggested). The Subjects act — they either INform or OUTform — and this action produces an Object. Creating/OUTforming: An ovulating female is potentially receptive (ULQ) to the seed of a male (URQ). In this upper-quadrant, “Private Night-time” relationship, the Female Subject and Male Object are mingled-in. During pregnancy the mother builds a baby inside herself from her own resources. The mother is the Subject, the potentially Creatable substrate, whose internal actions are Creating a fetus. At the end of gestation, the mother delivers a baby into the visible world as a Created Object (LRQ). The baby is separated from the mother, who retreats (back to the ULQ) to Rest, as this is necessary to restore receptivity to a future pregnancy. The baby has become INformative (LRQ) to an INformable observer (LLQ), especially to the father who seeks his likeness in the baby’s features. INforming: We (as conscious beings) are the potentially INformable substrate (LLQ). When we encounter another person or object (LRQ), our external receptors perceive their vibes/body language and/or features. 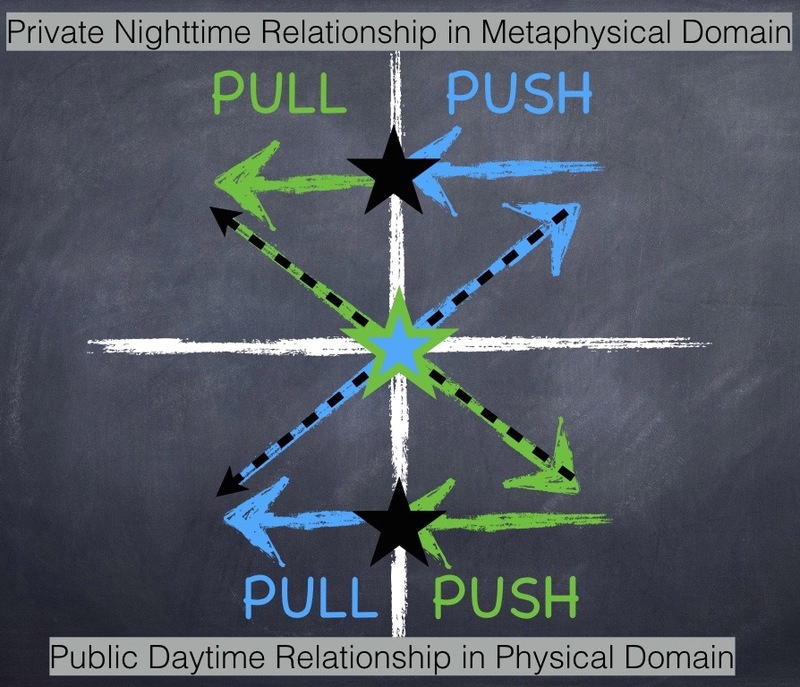 In this lower-quadrant, “Public Day-time” relationship, the Male Subject and Female Object are singled out. Our mirror neurons enable us to develop resonance with perceived beings/objects, causing our energy frequencies to elevate and become expansive or to diminish and become constricted. As our receptivity, chemistry and emotional states shift, our altered emanations are recorded on surfaces everywhere as interference Patterns (Objects in URQ). Our Subjective interpretations thus INform the collective consciousness, which becomes an Informed Creative spark (URQ), which may once again influence/impregnate the Creatable matrix (ULQ). The Female Subject Rests in the metaphysical realm (ULQ). 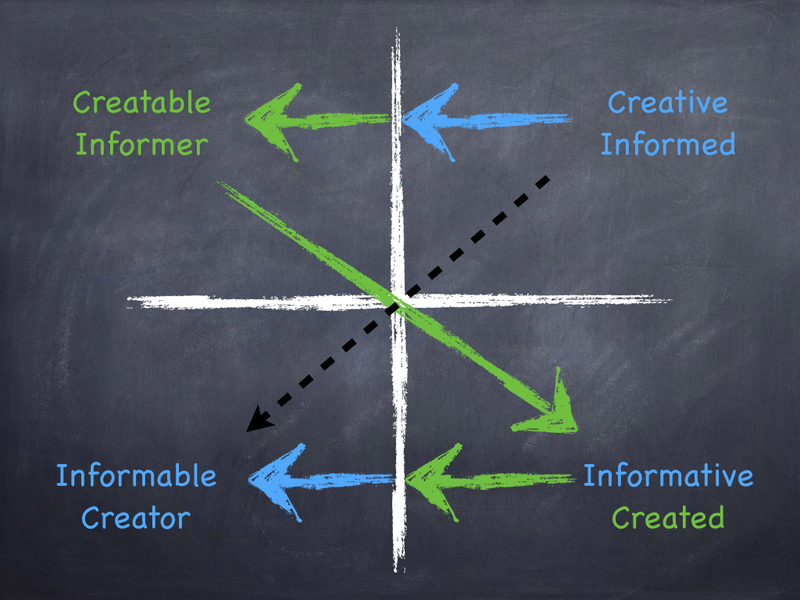 We will remember that this quadrant was the last to get its label when the first Quadrants of Creation appeared, and again when the Quadrants of Information appeared. It’s no wonder that the Female causal Subject is so mysterious, for She has been neglected for millennia. The Male Subject Rests in the physical realm (LLQ). This is ironic, as all our depictions of Father God are of Him ruling from the metaphysical Heavens. The upper quadrants, however, are the domain of the Female causal Subject (ULQ). Causal Subjects rule; Objects do no such thing. 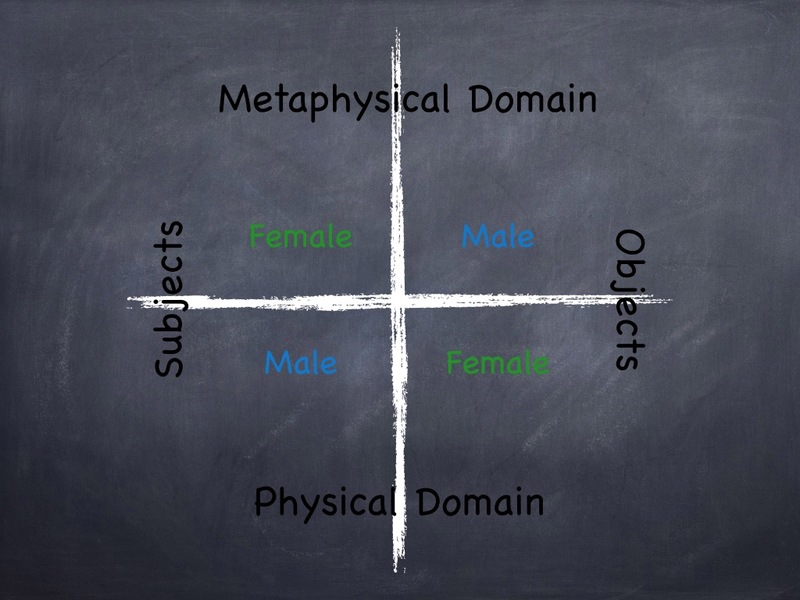 Although the Male‘s Objects, or Patterns, enter the upper quadrants (URQ) where they effectively Inform Consciousness (URQ), the power of the Male Subject is in His reception and interpretation of physical stimuli, which, of course, happens in the lower quadrants (LLQ). As the Female was dethroned by the patriarchy, Her powers, as well as Her lofty station in the metaphysical heavens, were reassigned to the Father. This imbalance has had untold deleterious political and cultural effects. The neglect of the Female and the consequent scientific efforts to override Mother Nature have brought us to the brink of extinction. Rather than assigning primacy or causality to either the Male or the Female, Quadernity shows the collaborators to be of equal stature and opposite functionality. They involve themselves cooperatively so that they may endure and evolve. There is involution/descent into the earthly/physical plane of Corporeality, followed by an evolution/ascent into the heavenly/metaphysical plane of Consciousness. The pulse of the Mother and Father dynamically sharing with each other is the rhapsody of the uni-verse (one-song), or ECP, in which all notes, great and small, rise and fall in their own time. As the Native Americans and other indigenous peoples well understood, our presence here on earth is provisional. Sadly, we have disregarded their wisdom. Profound is our ignorance about the greater whole into which we must integrate or perish. Through the lens of Quadernity, however, the depth of our ecology is staggering. Artificial disturbances can create “natural” disasters. Only when we understand that our world is a hierarchy of interlocking feedback systems with infinite degrees of sensitivity and fortification, will we finally stop meddling with our otherwise exquisitely resilient matrix. As long as we believe that causes and their effects are related linearly, and that they exist together entirely on the physical plane, efforts for advancement are thwarted. As a whole, the conscious corporeality/corporeal consciousness is a dancing duo. Only together can the duo dance the dance that perpetuates their relationship. As the dancers dance, there is dancing. And the dancing is, itself, the relationship, or the entity/system (E/S), in which, for which, and by which the dancers relate. No dancing, no dancers. No dancers, no dancing. Within the Ultimate Field, the One/ECP is rhapsodic. Its divine duality “trips the light fantastic“. Collectively holding the power of universal sustenance are two essential aspects of One reality. Neither the Female or Male is self-sufficient. They are a partnership that wins or loses together; therefore, each is engaged in the welfare of the other. This chapter focused on how Quadernity relates together the divine divisions, which have been described in sacred writings, biology, philosophy. About this idea there have been many philosophical debates. Quadernity shifts the paradigm, leaving behind materialism and leaving behind idealism. Quadernity even dives deeper than panpsychism, the position that all matter has some degree of consciousness. Quadernity models the fundamental unit underlying the creation of a conscious universe. The final aside for this chapter assists you in Comparing Quadernity with Panpsychism. Our next chapter delves more deeply into Pull * Transition * Push * Rest, Nature’s Ubiquitous Sequence. Played out by both Female and Male subjects, this sequence establishes all enduring entities/systems (E/S), giving them properties such as mass/inertia and temporal symmetry.